Welcome to the KAMATATECNAS Web site. Significantly decreases faulty operations and problems with precision pneumatic devices, which can be caused by drain contaminated air. It also reduces the production of faulty products by eliminating the drain (water droplets, oil, and dirt) that might be blown onto a product ! No maintenance or operating costs. 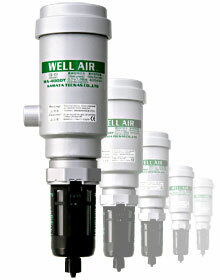 The revolutionary "WELL AIR" water remover was developed by a company that maintains and services air compressors ! Manufacture and sales of compressed air water removers.